Mumbai: Padayatras for a cause are quite popular in India. However, ‘Walk Of Hope’, is unique. It is one padyatra that is quietly promoting inter-faith harmony. No wonder then it has received a warm response from people from all religions, caste and creed. The walk, led by spiritual leader Sri M, was flagged off at Kanyakumari on January 12 on the birth anniversary of Swami Vivekananda this year. 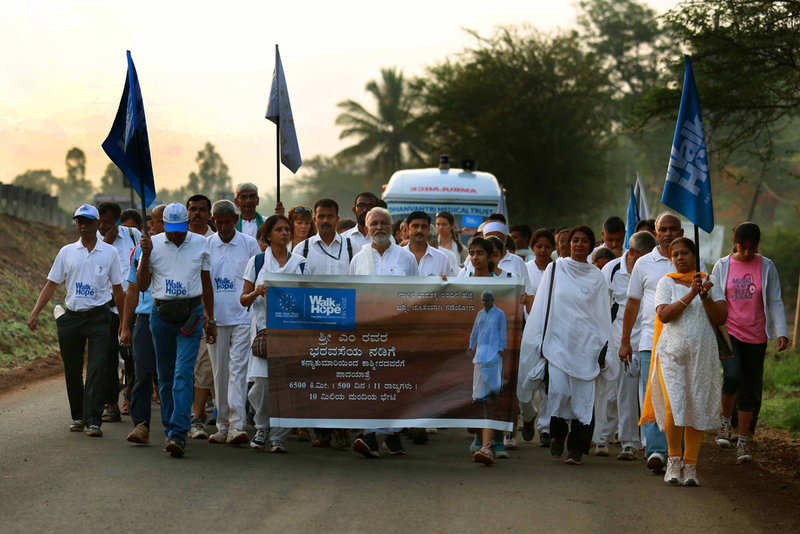 The walk started from Kanyakumari and will conclude in Kashmir next year in April. Sri M and his followers will cover a distance of 7500 kms across 11 states spanning 15-18 months to spread the message to over 10 million people on the way. It has been organized by the Manav Ekta Mission, which is a brainchild of Sri M.
“To understand it, we must first understand India. Ours is a baffling nation, full of contradictions and disparities. Over the years, this disparity has given rise to trends, good and bad. A trend that disturbs us is the regular outbreaks of communal violence. A stretch of peace and prosperity is suddenly arrested during such an outbreak. Lives are lost in large numbers and the society is torn apart. The progress of the nation comes to a grinding halt. By the time things return to normal, our nation has lost crucial opportunities in all areas of development,” says Sri M.
Sri M – spiritual guide, social reformer and educationist – was born into a Muslim family on November 6, 1948 in Thiruvananthapuram, Kerala. His transformation into a ‘yogi’ makes for a fascinating story symbolized by single-minded discipline and dedication. He travelled to the Himalayas at the age of 19 and met saints and sages. He is married and has two children. His autobiography, Apprenticed to a Himalayan Master – A Yogi’s Autobiography, is a bestseller. Based in Madanapalle, Andhra Pradesh, he leads a simple life – teaching and guiding the Satsang Foundation and Manav Ekta Mission. “The Rig Veda says—there is just one truth but we call it by different names. The source of all life is one. So uniting human beings is our priority. We must start with our country first, naturally. We must work for this country’s well being to heal its soul, so that our nation can progress for the sake of our future generations. It is for the non-political people to take the initiative. Therefore, we will walk together carrying a message of true faith, to restore the spirit of hope, love, peace, harmony and oneness,” he adds. The Padayatra covers 20-25 kms a day and halts in the evening at a village or town on the way. In the evening, they interact with the local leaders and also pay visits to all the religious places including temples, churches and mosques in the village or town to tell them the importance of living together and in peace and equality for all. So far, Sri M and a team of 70 walkers accompanying him from Kanyakumari have covered close to 2500 kms in the last 150 days and are currently in Maharashtra till August 3. The chief minister Devendra Fadnavis will receive Sri M and his team on June 13th in Pandharpur, say organizers. The organizers say that the walk is completely apolitical and is not affiliated to any religious organization. But, all religious groups and political parties including Congress, CPM and BJP have extended their support to it. Also, the funds have been raised from individuals and not from any corporate or government agencies. They will observe a day of fast against communal violence, terrorism in solidarity with the victims of terrorism and communal violence on July 5th in Pune.